After seeing the Lion king for the fourth time, the incredible, amazing and fantastic screen to stage is a bellowing success as it still brings joy and warmth. It takes me, as well as assuming many others to a place of innocence and youth when watching the play. 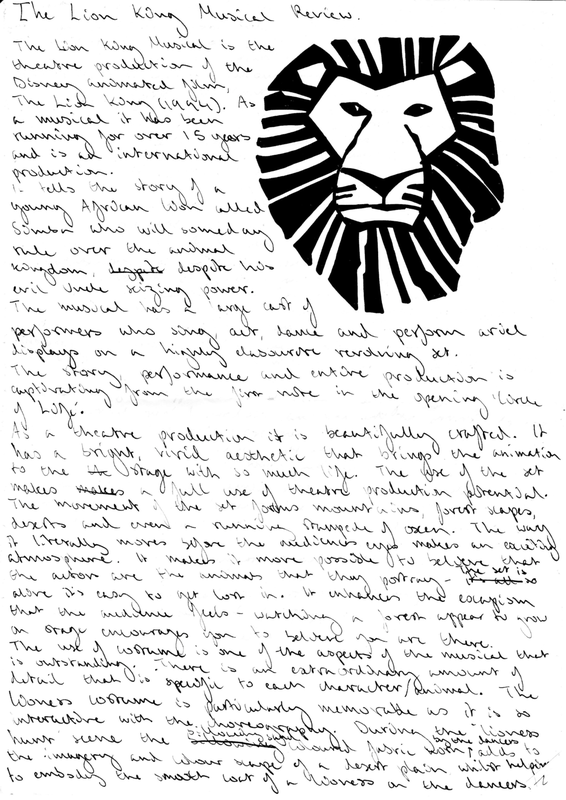 The Lion king is about a young lion prince called Simba, in which the play takes the audience on a journey, revealing the progress of Simba from a child to an adult as he faces his destiny (heir to the throne) in triumph and defeat for his Kingdom. The type of set that was displayed was a proscenium arch, which directly addresses the audience creating a perspiring atmosphere, when all the dances and actors were on stage. This strong and joyous atmosphere was also emphasised by the whole company when giant elephant, giraffes, antelopes and various more animals brought to life by sensational and stunning costumes, special effects, such as back projection. The back projection was used to amplify the set, giving an impression that the audience were somewhere else and not in a theatre. 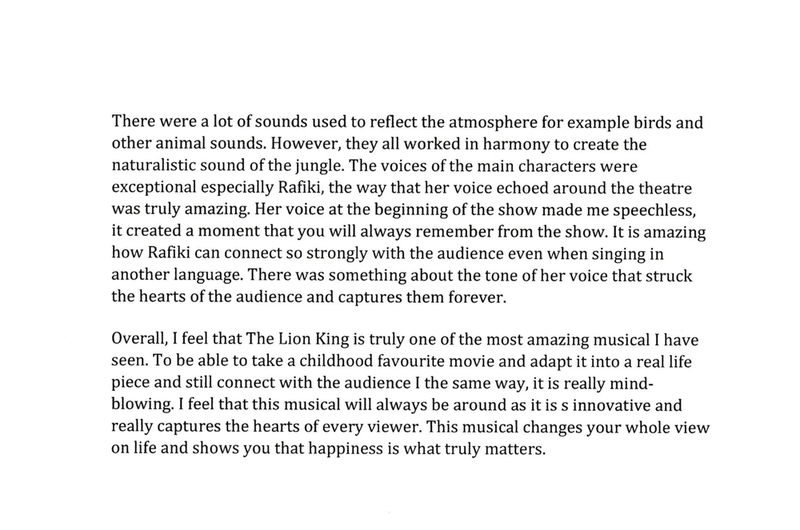 Furthermore, the moments that impacted me were the beginning and the end of the lion King. Having the whole company singing and dancing the circle of life at the beginning and at the end, he lives in you, showed the strengthen and solidarity of the kingdom as them come on one by one, moving from side to side.